Organic chemistry is the study of the structure and properties of carbon compounds. The field of organic chemistry covers the synthesis, isolation, purification and reactions of organic compounds and materials. Analyses have to be performed during synthesis and work-up processes to make sure that the desired compounds have been produced and to verify their concentration. Many of the methods used are based on thermal analysis techniques such as DSC, TGA and thermo-optical analysis. 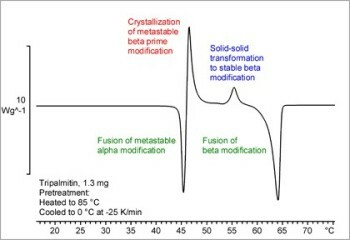 During synthesis and work-up, the focus is mainly on reaction kinetics and safety aspects, but content and purity might also be determined at many of the stages in the process. When the final product has been isolated, properties such as purity, stability, polymorphism, melting, reactivity, and so on will also be checked. The most important properties and effects that can be analyzed by DSC are melting, crystallization and polymorphism, enthalpies of melting, crystallization, and thermal stability. TGA is normally used to study compositional analysis, thermal stability and decomposition, evaporation and desorption behavior. It can also be used to identify gaseous products released during a TGA experiment if it is combined with evolved gas analysis techniques such as MS, FTIR or GC/MS. TOA is the method of choice for measuring visible changes such as changes in morphology, melting and crystallization.